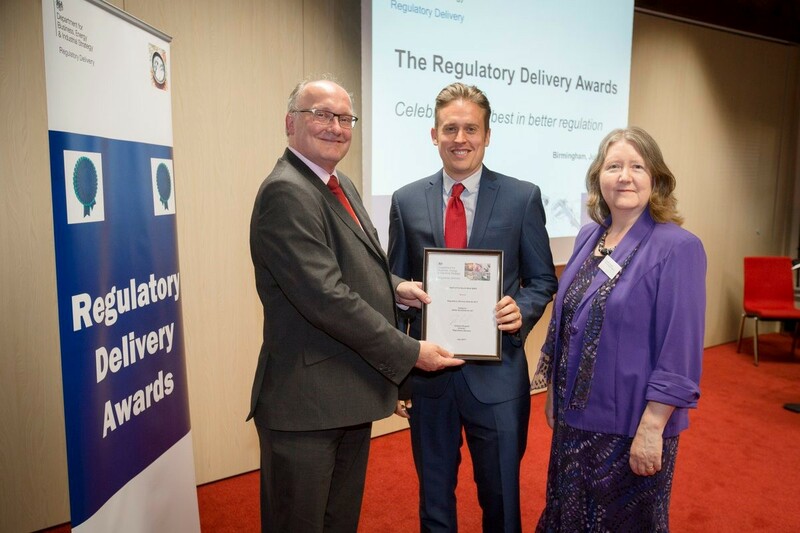 Devon Somerset & Torbay Trading Standards have been jointly honoured at the national Regulatory Delivery Awards for their work in boosting business by forging closer ties between traders and regulatory bodies. The Heart of the South West Better Business for All (BBfA) Partnership have won the Government’s Better Business for All Award at the ceremony in Birmingham. Devon Somerset & Torbay Trading Standards is a key member of the partnership. The Heart of the South West (HotSW) BBfA Partnership is an alliance of 19 local authorities across Devon, Somerset, Torbay and Plymouth, and includes the Fire and Rescue Service, the Heart of the South West Local Enterprise Partnership (LEP), the local Growth Hub, local Economic Development Teams, and a wide ranging group of business representatives, including Chambers of Commerce and the Federation of Small Businesses (FSB). The partnership aims to make regulatory services a key part of business support and growth, and aims to promote local economic prosperity, whilst maintaining public protection. The partnership has made a real impact by improving the way regulation is delivered and received, with a focus on business support. It has built excellent working relationships across the region, with colleagues both in local authorities and in the business community. “The award is national recognition for what has been achieved by the Heart of the South West BBfA partnership”. “We have achieved much with our HotSW BBfA partners on how regulatory services actively contribute to the business growth agenda. “Thanks are extended to the management and individuals across our Local Authorities, Devon & Somerset Fire & Rescue Service, our Economic Development colleagues, the HotSW LEP, the HotSW Growth Hub, and our business partners, local Chambers and the FSB. They have got behind the BBfA vision and have all contributed greatly towards making our BBfA alliance a reality. “Congratulations to the HotSW BBfA Partnership, they thoroughly deserve the award.